I am very aware that this post is overdue since I said I’d put up a new weekly post on time for the weekend. Well, what can I say, things just got a bit too busy last week and I’m really sorry for the delay! This delay is even more annoying as I had timed the recipe for this post with American Thanksgiving and now it’s not even Thanksgiving weekend anymore. In fact, yesterday was the first Advent which means that for us Germans, one of my favourite times of the year has just begun: the Advent Season! Die “Adventszeit”, or rather the first Advent Sunday, is the start of baking and eating all the lovely gingerbread spiced cookies Germany does so well, so I should probably blog about that. 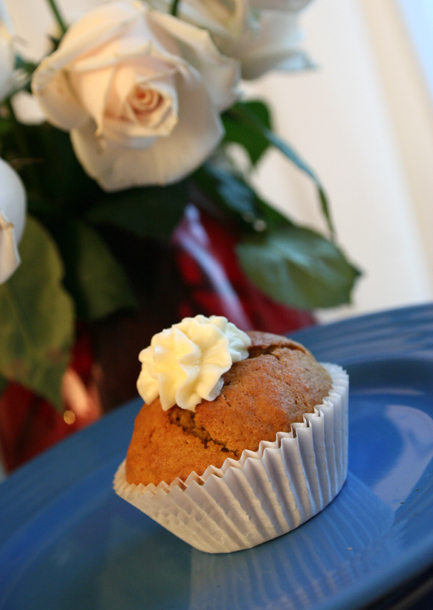 But I still have 3 more weeks for that and as I had planned to tell you about these little pumpkin cupcakes as an alternative to pumpkin pie, I’m going to do it anyway – even if it is 5 days late! Traditional Pumpkin Pie is a very American thing and, I find, not necessarily to every European’s taste. I therefore wanted to make something a little different for my friends here and went on the search for a pumpkin cupcake recipe. I tried out two different ones and – along with my tasting team – decided that this one gives the better result for the cupcake. As for the icing, I stuck with what I knew works, which is the same icng as with the Chocolate Guiness Cupcakes. So if you’re not fully over all things pumpkin yet, you might try making them – or wait for the whole Thanksgiving thing to come around again next year! Preheat the oven to your oven to gas mark 4 and line your muffin tins with wrappers. Mix all dry ingredients together, so that’s the flour, baking soda, baking powder, salt, cinnamon, ginger, nutmeg and allspice. Set it aside. In another bowl cream the butter and sugars together with an electric mixer until fluffy. Then add your eggs, one at a time, followed by the pumpkin puree, which is also added best slowly, in about 3 batches. Lightly whip the cream cheese with an electric whisk until smooth, then add the icing sugar and carefully whisk it in. Add the cream and beat again with the electric whisk until it makes spreadable consistency. This entry was posted in Cupcakes and tagged cupcake recipe, easy recipe, fancy cupcake, frosting, halloween, icing, pumpkin, quick recipe, recipe, sweet cupcake, tasty, thanksgiving, treat, unusual. Bookmark the permalink. mmm, sounds lovely, though i’m not really a cupcake girl. suggestion: Turkish cusine is big on candied pumpkin, and often uses it in desserts. you can also get it in slices, which would make a pretty decoration for this cake. i think you can get it from the various Turkish Food Centres, and it’s definitely available at Peklunu, on Shacklewell Lane in Dalston (Kingsland Road end).